I do not know whether I am more surprised by the book itself or my reaction to reading it (Lewis Thompson's 'Fathomless Heart'). When I was in my school sixth form, aged from sixteen to eighteen, occasionally, about the middle of the day, I would be seized by a complete reluctance to stay at school. It had exhausted my patience. This was often triggered, I confess, by either a double period of physical geography or of economics (more usually the latter)! I would develop a nascent cold and feigning sickness go home, sit in bed, feeling luxuriously sorry for myself, and reading William Blake. Later that day (after the final school bell would have tolled), I achieved a miraculous recovery. David Munrow and his Early Music Consort was a key driving force in the rediscovery of early music in the United Kingdom (and further a field) in the 1960s and 70s. It was his records that I purchased first when at university I found myself studying next to the Wigmore Hall in London and attending early music concerts. I bought his 'Music of the Crusades' recently (on CD) and was listening to it on the way to the office this morning. How extraordinarily precise can audio memory be - I had not heard this collection for more than a decade but could anticipate each new track. The joy of medieval music is its capacity to be wholly reverent and irreverent at the same time. A four part song can be three part reverential, fourth part subversively bawdy and yet you sense both are meant. There is a time and place for both dispensations (and they can live side by side). It is a living reproof to fundamentalism (and Puritanism). Two weeks ago, I am passing by Watkins, the long running esoteric bookshop in Cecil Court, London and drop in for a moment, not thinking to buy or indeed look for anything in particular. In the comparative religion section, I see a book, 'Fathomless Heart' and take a look. It is by a Lewis Thompson (of whom I have never knowingly heard) and is subtitled, 'The Spiritual and Philosophical Reflections of an English Poet-Sage'. 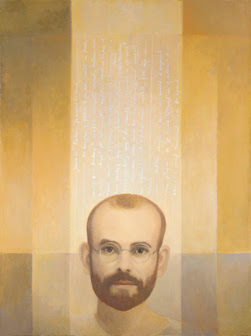 Further looking tells me that he may be of some interest having been a writer who went 'East' (in this case to India) in the 1930s and whose work grew out of his dialogue between India and a Western poetic tradition, a mention that this tradition included Blake and Yeats and my attention is arrested and deepened. He drove us to the airport yesterday. He was a big man with straggling beard in a crumpled white pin stripped suit. He was garrulous - occasionally announcing that he had better shut up now and concentrate on getting us to the airport only to start up again in the hairbreadth of a moment. We learnt first that he had studied mathematics and physics at university (in Zambia) but failed the last two courses (in quantum theory) and, because he did not have money to re-sit, had to leave university without a degree. I was reminded of those business cards you used to see (in India) with BA (Failed) on them. The person, at least, had made the attempt and that was a source of justifiable pride. The taxi driver had his transcripts, he told us, fourteen of sixteen courses passed. The mixture of pride and opportunity lost in his voice was breakingly sad. There is an established Benedictine tradition that the 'Rule of the Master' which is a long, ponderous, prescriptive and punitive text was St Benedict's first attempt at establishing rules for a community. So 'successful' was it that the community demonstrated their 'satisfaction' by trying to poison Benedict. God, as the ultimate arbiter, recognized in Benedict a hidden gem and so, helpfully, warned Benedict of the plot against him and saved his life. But also saved from an early death, Benedict listened to this radical expression of 'employee' views and changed. At the heart of the Rule of St Benedict - a slimmed down, compassionate and framing (rather than prescriptive) version - lies the importance of 'listening'. It opens with the invitation to listen with the ears of the heart to the words of Christ. It sets the tone for the whole. 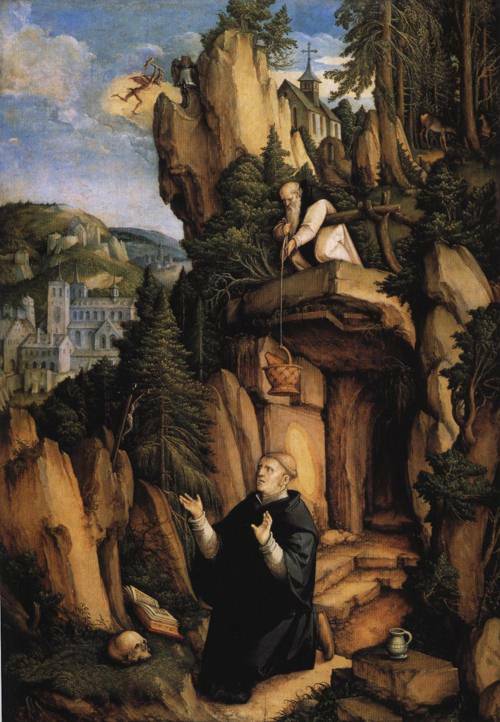 Today, I was giving a talk on 'Christian leadership' using St Benedict as my exemplar. I arrived in Johannesburg this morning to a bright, sun filled day in the medium twenties. The roads peaceful of an early Sunday morning, I drove past the varying skyscapes, landscapes that make up the city. From the distant skyscrapers of downtown Johannesburg which, the last time I saw it ten years ago, had effectively been abandoned by fleeing whites and looked sad, battered and empty to the nearer sight today of the township of Alexandra with its neat, brightly coloured, new houses each with a solar water heater perched on top. At the hotel, the solar water heating was creating something of a challenge - both the shower and the bath appear to be directly serviced by it. So about midday, after a reviving nap, the water emerging from faucet and tap was extremely hot, unsuitably so. In the end I had to run a bath and cool it down with a combination of water ferried from the sink by way of a kettle and patience. 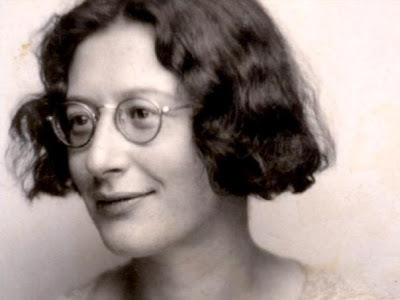 Simone Weil is dead of tuberculosis - a disease helped on its way by her refusal to eat properly (as she wanted to keep to the rationed diet that she believed her French compatriots suffered in occupied France). Her exemplary biographer, David McLellan, eloquently disposes of the charge that this pattern of restricted diet betokened anorexia rather it was a penitential sharing of affliction. There is something rather beautiful in this austere pattern and something rather perverse (after all the French population, in actual fact, were engaged in a very pragmatic set of strategies to avert living on the official ration)! A third century Roman martyr whose date and place of death we know yet nothing else seems strangely appropriate for a day devoted to love whose reality is just so, and yet remains an endlessly unfathomed mystery! 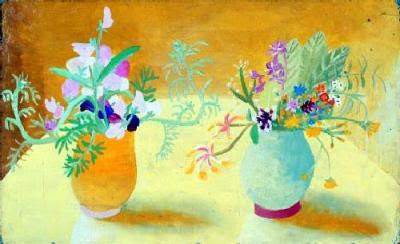 For flowers, I thought this painting by Winifred Nicholson: two pots of honeysuckle and sweet pea, both standing apart, as themselves, and yet also together, tendrils reaching out, offering to entwine. And loved for themselves - for their colour, radiance, life - and yet, paradoxically, as soon picked, transient, passing away. Yet, as with all of Nicholson's art, the suggestion that each and every particular thing dwells in yet something other. Transience dances across a field in eternity. Every loved moment rests in a memory everlasting. 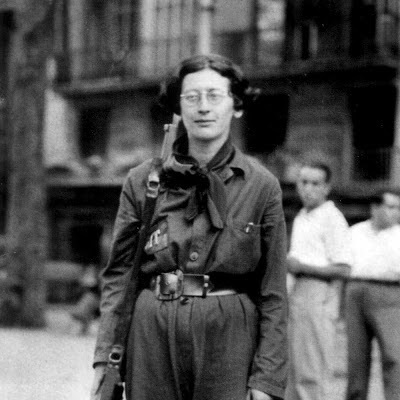 Simone Weil was fiercely intellectual, socially awkward, a strange admixture of generosity and vehemence, of sensitivity and thoughtlessness. She was one of the great religious thinkers of the last century whose lucid, penetrating prose, slowly emerged after her death (at thirty four) to great acclaim. It is not often you can read two books in one morning on a short trip to London! They are both short (and one richly illustrated) and by intellectual giants of the last century. Martin Buber's 'The Way of Man according to the Teachings of Hasidism' is six short chapters, each built around a parabolic episode in the life of an early Hasidic master with commentary and related sayings. It is a beautiful distillation of both Buber's interpretation of this tradition and through its lens of his fundamental attitude towards life's meaning. Through it we discover that each of is called to our own particular way that requires us ever again to find a unity of soul and intention and to live directed towards others, beginning now from wherever we presently stand. 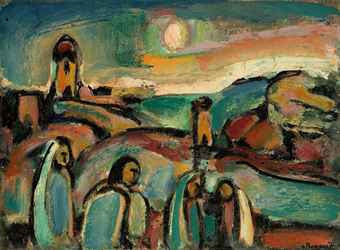 "In the world to come I will not be asked: why were you not Moses? I will be asked: why were you not Susya?" declared Rabbi Susya on his deathbed. The original book - not the films transposed to America in which people (at least the central characters) behave more heroically and appear more religious than H.G. Wells imagined - whatever else his English victims are, they are not particularly stiff in the upper lip nor impressed by organising God! Indeed Wells life long fear of disorder is prominent in the book - we are only a step away from social chaos and once the full horror of Martian invasion dawns, people collapse, for the most part, into panicked fear. 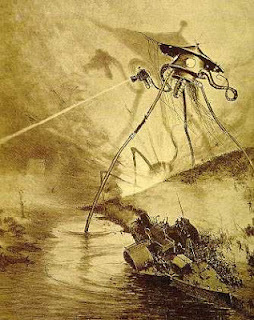 It was said that Wells picked the baton of science fiction from Jules Verne but as Borges noted whereas Verne extrapolates from the known - a submarine, rapid transport around the globe - Wells injects the radical break of the wholly speculative - time travel, an invisible man, life on Mars. When I was much younger, I nearly had a career as a documentary film maker (as unlikely as it might sound), for I and a friend submitted a proposal to the BBC for a series of programmes on what 'we' in the West might learn from traditional or indigenous societies. The proposal went right to the last hurdle and fell because Alan Yentob, then Controller of BBC2, had not liked my friend's previous work for the Corporation. Channel 4 subsequently made (badly) a series with a similar theme and this strand of opportunity was lost (to the world, and to me). The subtitle of Jared Diamond's latest book is 'What can we learn from traditional societies?' which Stephen Corry of the human rights group, Survival International, finds unobjectionable, it is the title itself (as well as the content) that has sparked controversy; namely, 'The World Until Yesterday'. 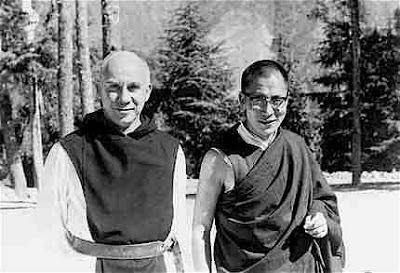 'Merton and Buddhism: Wisdom, Emptiness and Everyday Mind' is a volume in the excellent Fons Vitae Thomas Merton Series. It began as a series of papers delivered at a conference in Louisville, Kentucky and then has been shaped into an illuminating and, with its sensitive selection of photographs and quotation, a beautiful book. I came away from reading it with the phrase 'embodied practice' running through my mind - not only the practice of spiritual living that is (or can be) monasticism (both Buddhist and Christian) but critically that of the arts too. Merton was an accomplished artist, photographer and poet and the discipline of each was put at service both of itself and illumination. I spent the last two days visiting community development trusts in South Uist in the Western Isles and in and around Glasgow run by deeply committed and quietly imaginative people seeking to reweave the possibilities of community and develop practical projects that will provide facilities for their community, whilst generating employment and income. This latter piece of the picture is increasingly critical given the shrinkage of support from the state. It has never been more important to be self-reliant. But self-reliance is grounded in collaborative sharing within communities and between them and my two days were spent exploring how the trusts could be supported with common services increasing their availability to each by sharing their development and cost.